The classic apocalyptic novel that stunned the world. I like this book, but not for the reasons I expected. First, unlike most post-nuclear books, this is mostly a strict survival story with few nuclear elements. In fact, the characters only encounter radiation in one small subplot. Therefore, the nuclear war is merely a backdrop. The book tells a survival story where a small town is cut off from the rest of the world (which mostly no longer exists) and must make do with existing skills and resources. The central hero, Randy, is appealing and believable. The characters are the main reason to like this story. None of the main characters "turn bad" post-apocalypse style, so the tension is mostly generated by sympathizing with these people and their trials. A simple story, but certainly worth reading. If you came to this book looking for Mad Max, dont bother. If you want to reinforce your concept that life on Earth will end with the explosion of one nuke, go elsewhere. But if youre interested in how the collapse of society would impact everyday people, this novel is for you. Pat Frank takes a fairly reasoned look at the affects of a nuclear war on small town America in the early to mid 1960s. To put it in a nutshell, everone in a small Florida town goes stir crazy for a few days after the bombs drop, looks around and sees they may survive if they act normal and build a new society and economy. How they get from point A to point B is the real joy of this book. The one legitimate flaw with this tome that others have pointed out is it is quite dated, especially when considering race relations. Also, gender issues are dealt with from an angle we would not be used to today. Most (but not all) of the black characters are somewhat ignorant of the larger world. The female characters are emotional and are prepared to collapse into crying fits over the smallest of quandaries. That said, Pat Frank does present these characters sympathetically and allows them to shine. In ways, this quirk enhances the book as the author's take on these matters is largely appropriate to the time frame. The next major point of criticism is that the book doesnt accurately reflect the truth about nuclear war as there are survivors. When considering this issue, one must remember the time frame of the story. The Soviets didnt have that many nukes in this time period and had very little capability of dropping them on America. If anything, Frank goes beyond what would be likely. While it's not exactly a first-person point of view, this book's 'narration' of events and storyline are excellent, and make you feel as though you're right there. It's deep, it's all encompassing, and it really brings to light the fact that we are somewhat ignorant and unaware of our own surroundings. People think that the Cold War is defined simply by a period of living in fear of a Red Invasion & Nuclear fallout. We can sit around now and laugh at how paranoid people were. However, the times we are living in NOW could be considered just as uneasy and paranoid as that period in time. It's a good read, very simple yet complex in its plot. When I saw Alas, Babylon in the bookstore, I recognized it as a classic title but knew next to nothing about it. So, I picked up a copy to read on vacation. My verdict? Very good book -- not a very good vacation read! This is one of the first post-nuclear apocalypse tales, published in the thick of the Cold War in 1959. Although world events have made the political backdrop of this novel obsolete, Frank tells a tale that still resonates. The broad strokes of this story may feel familiar to us now, because we've been exposed to other post-apocalyptic tales in which people are suddenly stripped of technology, medicine and the comforts of modern civilization. In fact, if you watched the television series Jericho, you'll see a huge amount of similarity in Alas, Babylon, minus the soap opera elements found on the TV show. Outdated? Did we read the same book? Some people say the book is outdated, but really, we are under the same dark cloud that was there during the Cuban Missile Crisis. Granted, the strike zones today would be different than those in the 50s, but Nuclear Warfare is a very real possibility. North Korea?! HELLO! The best thing about this book is the setting. The descriptions of a post apocalyptic United States is excellent. It really made me think about what civilization means: law and order, running water, food supplies, transportation, etc. The biggest flaw with the book is its characters. The character development is non-existent. Randy, the protagonist, is extremely bland. He has no flaws (well, he's a liberal) and a perfect leader. The story is also extremely optimistic. Personally, I like a bit more cynicism. Every year I dread summer reading for school. Not because I don't like reading, on the contrary, I love to read. Yet I always feel limited when I look at the list offered by the school and see nothing that tickles my fancies. This time, it was different. I took out a book titled Alas, Babylon after hearing it was a Post-apocalyptic tale. Boy, am I glad I did that. The novel was captivating, with wonderful characters, a great setting, and did I mention, wonderful characters? While the story is a bit unbelievable, (the family lives about what? 50 miles from a nuclear attack), it makes up for the realism in so many other ways. I just finished reading this book on the advise from a friend of my wife. I have to say that it is one of the more realistic post nuclear war books that I have read to date. The book accurately deals with the long term shortages of both food and water. It also depicits how the main characters overcome not having these necessities available. Wide scale looting is also presented which, I would say is pretty realistic in light of the recent events following hurricane Katrina. I would reccomend this book to anyone who takes their survival seriously and wants a realistic view of how drastic their life would change due to nuclear war. Even though the story takes place during the height of the Cold War, the message and it's lessons are still valid. I read this book the first time when I was a very young teenager~~at the height of the Cold War/Political Paranoia Age~~that time of bomb shelters, Civil Defense emergency drills, and children hiding under desks from Hiroshima-like devastation. The threat of nuclear war has not disappeared; it's only been minimized as other threats have joined it. Terrorism, global warming and the faltering economy threaten to do just as much damage as a nuclear weapon could but in different ways. Pat Frank masterfully weaves a wonderful story about survival after "The Day". The ending message is not that Nuclear War is inevitable but that it can be avoided and survived by some should it occur. This message tends to be a reoccurring theme in many of Frank's books. Overcoming unlikely odds to see the light at the end of the tunnel. I will agree with another reviewer that Frank's characters do tend to be underdeveloped, but that's just fine with me. It's like the same in life; sometimes what lies beneath the surface isn't revealed immediately. If it ever is at all. I give it five stars; it definitely deserves to be the classic that it is. People interested in this book might also want to check out 'Hold Back The Night' which is about a Marine company's experiences during the Korean War. ALAS, BABYLON is the story of a washed-out lawyer living in small-town Florida in the 50s. In the aftermath of thermonuclear war, he becomes the leader to rally his family and neighbors to survive in the desperate situation. I'm afraid I can't say much to recommend this book. The characters are flat and uninteresting, with persons of color and women portrayed as the barest of stereotypes. Far too much time is spent in the beginning of the book describing the chess-like moves of the USA and Soviets that lead up to the war. This book is probably typical of the mentality of the 50s, but seems extremely dated to a modern reader. The `group of survivors after a world-wide catastrophe' has been done much better by other authors; for example THE STAND by Stephen King. I've read Alas, Babylon several times over the years. It is always worth picking up again. Pat Frank writes with a distinct style that accurately captures life in 1950's Florida. His work starkly highlights how different our racial attitudes, sexual mores and cultural taboos have become since those days. The writing is entertaining, compelling and full of rich characters. Perhaps most importantly, Frank was one of the first to chronicle a threat that is still with us, the threat of nuclear conflict. In Alas, Babylon, the threat is between superpowers. The bombs of that era pale in comparison to the bombs that exist today which only serves to make the imagined reality of life after nuclear war more sobering for a reader in the year 2007. Pat Frank had the fine idea to focus on small area after a nuclear war and limit the perspective to what one somewhat isolated area experiences. He's got a good idea for logistics -- what preparations could be made before the war, how people could make due with what is stocked, how their resources and resourcefulness would serve them, and so on. So it's interesting to watch as events play out for one county. The problem is that the dialogue is often pretty stilted and painful. Some situations seem a little too much of their time, as well -- the women tend to sit back and see what the men do and don't take leadership roles; hardly likely in any era when humans themselves have become a precious resource. (One woman ardently keeps the telegraph office going, but that ain't much.) The children also seem to be either young for their age or wisely and stoically old for their age, so it reads very much like 1950's melodrama. Fortunately, the nuts and bolts of the thing are absorbing enough to keep things moving. The end is a bit abrupt, but believable. great, but a little outdated. I am in my mid twenties so I was not afforded the displeasure of living through most of the Cold War. Therefore, "Alas,Babylon" was a book I didnt quite identify with. At least not as much as a baby boomer might. That being said, It is nessecary to understand to fully appreciate this book. The book itself is great. I had trouble putting it down and finished it in about 48hrs. It is the story of a families life during a nuclear war. I estimate the time period to be around the late 50's to early 60's. The novel drags a bit in spots but the overall effect is gratifying. I feel the novel gets the point across while being very entertaining. I was born in 1985, and so didn't have the fun opportunity to live through the Cold War. Alas, Babylon tells the story of a small Florida town that lives through the nuclear exhange of a Third World War. Unlike most Cold War-Third World War books, Alas Babylon doesn't seem dated. It's better written than virtually all of the type, with an excellent story, and well fleshed-out characters. Overall, the story goes through three stages. First is the buildup to war, with the establishment of characters and setting. Second comes the war itself and the crisis immediately following. The story stays confined to the town; the authors don't feel the need to go over every little aspect of the war, which is a definite plus. The final stage and conclusion comes as the town adjusts to its new condition, cut off from the world, and contact with the remains of the US government is established only at the end of the book. Even though this book was written over 40 years ago, it is still very pertinent. Part of what I enjoyed about this book was that it was centered around a group of people that really weren't prepared for such an event. My first experience with this book was when we were required to read it in our ninth grade English class. I enjoyed it so much that I have read it twice since then. The premise is that there is a great deal of tension between the Soviet Union and the United States and it erupts into a full-blown nuclear exchange. Randy Bragg lives in Fort Repose, a small town in Central Florida. His brother is an officer in the Strategic Air Command and sends his family to Randy's home where he thinks they will be safer. While Randy is warned about the possibility of a nuclear war and he tries to prepare, much of what he does is of little value. The bombs explode and the world is suddenly turned upside down. On the bad side of the ledger, society is disrupted and there is a substantial collapse of social order. On the good side, it brings people together and all racial animosity between blacks and whites is gone. Since he also served in the military, Randy organizes a defense force and strikes back against the criminal element. With the help of the local black people who are more accustomed to doing without and improvising, they start to rebuild their society. They begin producing food, moonshine and learn to eat animals that they previously would have ignored. This is the best post nuclear holocaust book that I have ever read. It speaks of the incredible destruction, but also demonstrates the resilience of the people. If there is one weakness of the book, it is the lack of hordes of outsiders moving into their area. With the large tourist population of Florida, there would have been a flood of refugees moving into the area. In this book, that does not happen. In real life, there would have been a flood of sick and dying people desperate for any kind of assistance they could have received. It's amazing how a book can change your life. For decades, I've been reading "facts" about being prepared for emergencies, both national and local. Living at the coast of SC taught me the value of stocking up for hurricanes and power outages, but truly, we knew that within a matter of a few days (probably hours), we'd have our power back on. When I was a child in the 50's and 60's, I participated in many "drills" that taught us what to do in case of THE BOMB. However, nothing woke me up like this work of fiction by Pat Frank. After a nuclear holocaust affects most of the world, a small community in Florida somehow survives, and the book takes us through the events that change their lives, shape their relationships, and define their character(s). Things happen quickly in Alas Babylon, and I found it hard to put the book down once the bombs were dropped. The small community of Fort Repose and its cast of characters banded together to survive, and in doing so, they learned the value of interdependence and "pluck." Sure, there were elements of cruelty, cowardice, and greed in the novel, but there were also love, courage, and hope. The book arrived within a couple days. A week later, I received another copy along with a charge greater than the initial one. When my next VISA statement arrives, I will be able to see whether I have been properly refunded for the second book as well as the return postage. 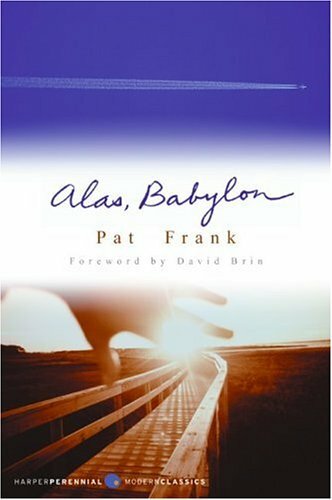 Before I passed Alas Babylon along to my sons I thought I would re-read it. When I was a young boy and read it for the first time I really enjoyed the survivalist theme. I found a lot more to like on my second reading. Mr. Frank weaves several strong moral fables inside the basic survival novel that really "makes" the story. Mr. Frank uses the nuclear backdrop for his most obvious morality lesson on racial equality. Nuclear war is a great equalizer. Set in racially segregated 1950s central Florida, he ensures all nuclear holocaust survivors work together, regardless of race, gender or age. For if they don't, there are immediate consequences. It is a strong and positive message. The outcome of excess greed is also highlighted and dealt with harshly. Thieves are left to die of radiation poisoning because they stole radiated property. The technical aspects, while dated, are still pretty good. The air-to-air missile that starts WW III is a little out there, but since it's just a small vignette, it's easy to forgive. I look forward to my sons reading the book and the discussions it will conjure. From nuclear war to race relations to the drastic moral outcomes for greed, I think it will all be interesting and informative for them. An absorbing rendition of nuclear apocalypse or at least one version of it penned in the 1960's. In one context, this portrayal seems so quaint. The society that survived was propelled back to the 19th century. How times have changed. The mega tonnage of nuclear weapons greatly exceeds whatever was the threat 40 years ago. Society - if it survived at all--might be hurtled back into the Dark Ages or Stone Age. To think of a world where there was but one threat, the Soviet Union! Of course now, it is a multiple choice game of America's nuclear enemies: North Korea (bad haircuts and all), Iran and Islamic jihadism fantasizing about ways to nuke the USA, etc. .
Pat Frank's vision shows how relationships survive even when society is frayed. It is a cautionary tale where, only on the last page is it revealed who actually won the war. The political subtext seems to be, at this great cost, does it really matter who won? What does "winning" look like in a nuclear exchange? Were we to concede Frank's point, what is the upshot? Unilaterally disarm? Abandon nuclear weapons? Give America's enemies a stern talking to? Who knows? We can all decry the horror of nuclear weapons and the prospect of Armageddon. Alas Babylon is a haunting (and cautionary) tale warning us 40-years later that the Doomsday Clock is closer to midnight than ever. I set out on a `mission' with an objective to finish Alas, Babylon before the New Year. I started last night (December 28) and finished at exactly 12 o'clock today. The hours I spent reading this piece of literature were long, but I am happy to be writing this entry, knowing that the book is now behind me. What can I truly say about Alas, Babylon? Reflecting back on the book, I realize that it really did not appeal to me. I'm not saying this because I did not care for it, but because novels about the military can lose and confuse me at times. When I read Pat Frank's book, I knew only a few of the combative terms used, and that was due to a project I did last year. Still, I cannot reflect negatively on some parts of the three-hundred-sixteen-page literary work Mr. Frank has composed. His attempt to entice readers with love, mystery, and justice did not go in vain. Pat was able to accommodate many different point-of-views into one, well functioning plot. Slowly, elements combined to keep the story in motion. Through a seemingly predicable plot, there were actions that caught me by surprise. I wasn't prepared for Edgar Quisenberry, the bank president, to commit suicide. The author's way of leading up to that event made it seem so sudden, so unforeseen. Unfortunately, like a dying light bulb, the story's plot flickered, leaving you bored and in the dark. I cannot honestly say that every single page was slow, but the author showed a lack of ability to keep up with a fast rhythm. One event that illustrates my point is the part where Randy and other men are in the grocery truck about to kill the highwaymen. This part, where the reader would expect fast and witty action, was instead written with a quick `bang-bang-it's-all-over' sequence. This is on of the best books of all time. The plot is well thought out and developed, the characters are realistic and the well rounded, and the details are fantastic. I read this book as a child, college student, and as an adult. Each time it was entertaining and gave the feeling that it was written today. Just today I recommended this title to a patron in my small rural library in North-Central, Florida. My patron is a relative newcomber to the area and I wanted to show him this vivid portrayal of life in pre-Disney, "cracker-country" Florida. Fort Repose was modeled after my hometown, so I always felt a unique connection to the book. I have actually purchased and given away at least a dozen copies of this book over the years and it is one novel, like To Kill A Mockingbird, which is as compelling on the tenth reading as it was on the first. It is incredible how things can change so drastically from one instant to the next. Such was the case in the book by Pat Frank, Alas, Babylon. When the bomb hit the people, the few survivors confronted a chaotic situation where only the strong and capable were able to remain alive. The challengers they endured were many, but I would focus on the three specific ones that impressed me the most: the necessity of obtaining food to survive in daily basis; the dangers of a community where the law was nonexistent; and the adaptation of a life no longer comfortable where everyone with the desire to survive had to deal with physical labor. In summary, there are many lessons we can profit from Alas, Babylon. I personally would like to start by preparing better for catastrophic situations. Food and storage should be of a concern to everyone. Even if we never get to use our supplies, the peace of mind of knowing that we are prepare will be worth the effort. Also, I would like to learn more about government and leadership. It's not a coincidence that Randy spent years of his life studying books and participating in governmental issues. Yes, he was a good man; but he was also prepared. Finally, there are many skills I could learn that would be helpful in a disastrous situation. Yes, Alas, Babylon! was a great read. If you want to understand the "Cold War," read this book. My first knowledge of this book was via a television dramatization when I was about 10 years old, circa 1960. It both enthralled and frightened me. Later, as a teenager, I read the book, and was again enthralled and frightened, but also comforted, for the book has - in a sense - a "happy" ending. The threat of nuclear war waxes and wanes in the public imagination, and - for now - has perhaps been supplanted in the apocalyptic imagination by such threats as Islamic terrorism and global warming. But if the Iranian and North Korean nuclear programs continue apace, the threat of nuclear annihilation might once again capture the public's imagination. "Alas, Babylon" takes us back to the 1950s and the Cold War, to a world in which the threat of nuclear war was very much on the minds of the average person. And the war - full-scale nuclear war - happened. Entire cities, even entire states, were wiped out or became uninhabitable. We are left with some of the survivors. They are in Florida, just out of the dead zones. Modern civilization is mostly over; we have martial law, no law, the law imposed by the man who happens to have a gun. There are runs on essential goods, banks close, money is worthless - $100 won't buy a box of salt. Light bulbs? Who needs them? The power plant is gone. Not out of service - gone. Read this off my pre - 10th grader's summer reading list. I had not heard of it. It was written in 1959, and yet much of it still is pertinent to the world we live in, were there to be a nuclear attack. It mostly covers a post-apocalyptic scenario in a small town in Florida. I liked the characters. It kept my interest the whole way through; I read it in one day. I don't know how readers who are in high school would enjoy it, it depends on their general knowledge level and reading interest. To anyone who has not heard of it, I would recommend it. I didn't want it to end. I am looking for more novels of this genre now that I have read this. You mean we actually won? Before you read this book, you need to re-aquaint yourself with the US of 1959. If you don't remember that time, you have to read up on it to understand that women still wore white gloves, TV was coming into it's own, people feared the USSR because of Sputnik; computers, Ipods, the internet, ATMs, Vietnam, were all still to come. Frank has written a fabulous account of how 'everyday people' would have had to deal with the aftermath of a nuclear exchange. A good part of the country is contaminated, almost every major city is gone, as is most of the governmental infra-structure. It's not a polyanna world, and it's not a 'Road Warrior' hell. It's people surviving day to day.